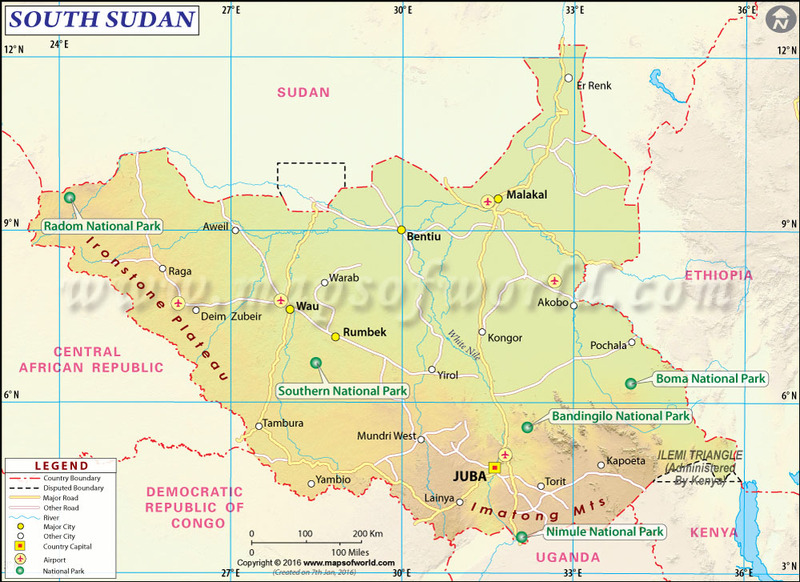 Description about Map :- South Sudan, the land of sand, sea and sun, is located in northeastern Africa that gained its independence from Sudan in 2011. Its current capital is Juba, which is also its largest city. South Sudan, the world's newest nation, is a country in eastern Africa. South Sudan was formed when it seceded from Sudan in 2011. Prior to that, South Sudan shares its history with Sudan and other nearby nations. Once inhabited by several tribes of indigenous people of the region, including the Mari and Moru, and ruled by the Nubian Kings, the Nilotic people arrived, settling in the region around 3000 BCE. The Nilotes persisted for many centuries, expanding their territory when the Nubian kingdoms, Makuria and Alodia collapsed in the 14th century. The 16th century saw the rise of the Shilluk people of the Nilotic ethnic group, who advanced their society to an agricultural economy. Farther north, and on the other side of the Nile River were the Funj people, who were at opposition to the Shilluk. The Shilluk united with the Darfur sultanate and the Takali kingdom to ward off the Funj, but were not very successful. Also in the 16th century, the Azande people migrated to the region, establishing a major settlement that persists today. Egyptian forces under Muhammad Ali invaded the region in 1821, taking control over the north and pushing into the south over the next decades. Under Egypt's control, merchants from Europe began to arrive in Sudan. Part of the region separated as Equatoria, which was founded by Isma'il Pasha of the Khedive of Egypt and governed by a British explorer named Samuel Baker in 1869. The British presence in the region led to attempts to unify South Sudan with Uganda, with the 1947 Juba conference, which instead united northern and southern Sudan as one. The union was not long-lasting, however, with the country's first civil war beginning in 1955, finally ending in the Addis Adaba Agreement of 1972. In this agreement, Southern Sudan was created as an autonomous region of Sudan. The second civil war began in 1983, when the Southern Sudan Autonomous Region was abolished, and the president declared the entire nation an Islamic state, requiring Shari'a law to be followed across the board. A peace agreement was arranged in 2005, but ended in 2011 with the independence of South Sudan. Continued conflict and border disputes frequently occur between the newly separated nations. South Sudan shares borders with Sudan, Ethiopia, Kenya, Uganda, Democratic Republic of the Congo, and the Central African Republic. South Sudan is a landlocked country in east-central Africa. Its three main regions are Bahr el Ghazal, Equatoria, and the Greater Upper Nile region. The major river of South Sudan is the White Nile, which traverses through the capital in Juba and divides the country roughly down the center. South Sudan's terrain includes tropical forests, swamps, and grassy savannas. Swamps surround the Sudd, Bahr el Ghazal, and the Sobat River regions. The main mountains of South Sudan are the Imatong Mountains in the southeast. The nation's highest point is on Mount Kinyeti, which has an elevation of 3,187 meters (10,456 feet). One of South Sudan's greatest draws are its natural sites, including Boma National Park and Nimule National Park, which offer safaris to view the various wildlife in the region, which includes gazelle, leopards, giraffes, zebras, and lions. Nimule National Park also contains Mount Kei Forest Reserve as well as Mount Otzi Forest Reserve. Boma National Park also offers a look into the lives of the indigenous people, who live nearby in traditional domed housing communities, such as the Toposa Village. Aside from its natural attractions, the cities offer cultural experiences, restaurants, markets, and hotels. The main airport in South Sudan is in its capital and largest city, Juba, which primarily serves several African nations including flights from Nairobi, Egypt, and Ethiopia. Long-distance buses are available from Uganda and Kenya. Crossing or even approaching the border between South Sudan and Sudan is seriously discouraged and should not be considered, as it can be very dangerous. Cars can be used to get around the country, and it's advisable to take a taxi with a local driver or rent a car, though conditions may not be great during poor weather. One method of transportation in the swampy regions of South Sudan is the Swamp Airboat, which are operated by guides to some of the national parks. The Flag of South Sudan was adopted following the signing of the Comprehensive Peace Agreement that ended the Second Sudanese Civil War.